A haggadic compilation on the books of the Old Testament. From such older haggadot as were accessible to him, the author collected various interpretations and explanations of Biblical passages, and arranged these according to the sequence of those portions of the Bible to which they referred. The individual elucidations form an organic whole only in so far as they refer to the same Biblical passage. Lengthy citations from ancient works are often abridged or are only partially quoted, the remainder being cited elsewhere. Since the interpretations of the ancient exegetes usually referred to several passages, and since the Yalḳuṭ endeavored to quote all such explanations, repetitions were inevitable, and haggadic sayings relating to two or more sections of the Bible were often duplicated. In many instances, however, only the beginning of such an explanation is given, the reader being referred to the passage in which it is recorded in its entirety. The work is divided into sections, which are numbered from Genesis to the end of Deuteronomy, and are numbered anew from the beginning of Joshua, the first non-Pentateuchal book, so that the Yalḳuṭ falls into two parts. The first division treats of the Pentateuch and contains 963 sections, of which §§ 1-162 relate to Genesis; §§ 163-427 to Exodus; §§428-682 to Leviticus; §§ 683-788 to Numbers; and §§ 789-963 to Deuteronomy. The second part deals with the non-Pentateuchal books (the Prophets and the Hagiographa), and contains 1,085 sections. In this part the redactor followed the Talmudic order of the prophetic books (B. B. 14b), §§ 1-252 being devoted to the first prophets (Joshua, Samuel, and Kings); §§ 253-335 to Jeremiah; §§ 336-384 to Ezekiel; §§ 385-514 to Isaiah; §§ 515-595 to the twelve minor prophets; §§ 596-609 to Ruth; §§ 610-890 to Psalms; §§ 891-928 to Job; §§ 929-965 to Proverbs; §§ 966-979 to Ecclesiastes; §§ 980-994 to The Song of Solomon; §§ 995-1043 to Lamentations; §§ 1044-1059 to Esther; §§ 1060-1066 to Daniel; §§ 1067-1071 to Ezra and Nehemiah; and §§ 1072-1085 to Chronicles. In the arrangement of the Hagiographa the author deviates from the Talmudic order (B. B. l.c.) by placing Esther before Daniel, while the reverse order is followed in the Talmud. The division into sections is arbitrary, and the sections are very unequal in length; Deut. 818, for example, in the Wilna edition containing only five lines, while Deut. 938 comprises eighteen columns. In his. exegesis of each passage, often in the text itself, the author indicates the sources from which his explanations are derived. In the Salonica edition they are given at the beginning of each corresponding Biblical passage, although in later editions they were placed in the margin. In many instances, however, the sources are given in an inconvenient place or are entirely eliminated; while some references are even indicated by a later redactor, as, for example, Job 921, where the source (Ex. R.) is a later addition, the original redactor being unacquainted with Exodus Rabbah (comp. Epstein, "Rabbi Shimeon Ḳara weha-Yalḳuṭ Shim'oni," in "Ha-Ḥoḳer," i. 137). The sources embrace not only the major portion of halakic and haggadic literature during the ancient and geonic epochs, but also the haggadic literature as late as the twelfth century. 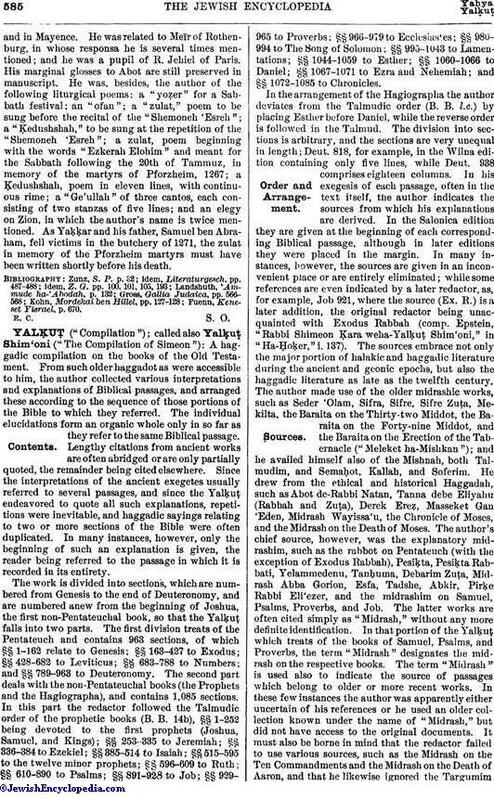 The author made use of the older midrashic works, such as Seder 'Olam, Sifra, Sifre, Sifre Zuṭa, Mekilta, the Baraita on the Thirty-two Middot, the Baraita on the Forty-nine Middot, and the Baraita on the Erection of the Tabernacle ("Meleket ha-Mishkan"); and he availed himself also of the Mishnah, both Talmudim, and Semaḥot, Kallah, and Soferim. He drew from the ethical and historical Haggadah, such as Abot de-Rabbi Natan, Tanna debe Eliyahu (Rabbah and Zuṭa), Derek Ereẓ, Masseket Gan 'Eden, Midrash Wayissa'u, the Chronicle of Moses, and the Midrash on the Death of Moses. The author's chief source, however, was the explanatory midrashim, such as the rabbot on Pentateuch (with the exception of Exodus Rabbah), Pesiḳta, Pesiḳta Rabbati, Yelammedenu, Tanḥuma, Debarim Zuṭa, Midrash Abba Gorion, Esfa, Tadshe, Abkir, Pirḳe Rabbi Eli'ezer, and the midrashim on Samuel, Psalms, Proverbs, and Job. The latter works are often cited simply as "Midrash," without any moredefinite identification. In that portion of the Yalḳuṭ which treats of the books of Samuel, Psalms, and Poverbs, the term "Midrash" designates the midrash on the respective books. The term "Midrash" is used also to indicate the source of passages which belong to older or more recent works. In these few instances the author was apparently either uncertain of his references or he used an older collection known under the name of "Midrash," but did not have access to the original documents. It must also be borne in mind that the redactor failed to use various sources, such as the Midrash on the Ten Commandments and the Midrash on the Death of Aaron, and that he likewise ignored the Targumimand writings relating to esoteric doctrines, with the exception of the "Otiyyot de-R. Akiba," to which he alludes in Gen. 1., § 1. The author of the Yalḳuṭ can not be determined with certainty. The title-page of the Venice edition ascribes the composition of the work to R. Simeon of Frankfort, "the chief of exegetes" ("rosh ha-darshanim"), and this was accepted by Conforte and Azulai, who called him Simeon Ashkenazi of Frankfort. Rapoport (in "Kerem Ḥemed," vii. 7 et seq. ), on the other hand, maintained that R. Simeon (the father of R. Joseph Ḳara), who flourished in the eleventh century, was its author; but this assertion is untenable since the compiler of the Yalḳuṭ used midrashim of a later date. 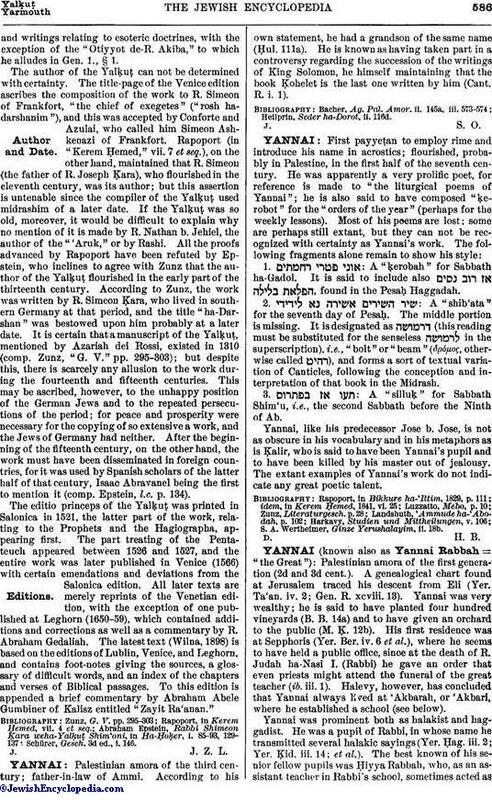 If the Yalḳuṭ was so old, moreover, it would be difficult to explain why no mention of it is made by R. Nathan b. Jehiel, the author of the "'Aruk," or by Rashi. All the proofs advanced by Rapoport have been refuted by Epstein, who inclines to agree with Zunz that the author of the Yalḳuṭ flourished in the early part of the thirteenth century. According to Zunz, the work was written by R. Simeon Ḳara, who lived in southern Germany at that period, and the title "ha-Darshan" was bestowed upon him probably at a later date. It is certain that a manuscript of the Yalḳuṭ, mentioned by Azariah dei Rossi, existed in 1310 (comp. Zunz, "G. V." pp. 295-303); but despite this, there is scarcely any allusion to the work during the fourteenth and fifteenth centuries. This may be ascribed, however, to the unhappy position of the German Jews and to the repeated persecutions of the period; for peace and prosperity were necessary for the copying of so extensive a work, and the Jews of Germany had neither. After the beginning of the fifteenth century, on the other hand, the work must have been disseminated in foreign countries, for it was used by Spanish scholars of the latter half of that century, Isaac Abravanel being the first to mention it (comp. Epstein, l.c. p. 134). The editio princeps of the Yalḳuṭ was printed in Salonica in 1521, the latter part of the work, relating to the Prophets and the Hagiographa, appearing first. The part treating of the Pentateuch appeared between 1526 and 1527, and the entire work was later published in Venice (1566) with certain emendations and deviations from the Salonica edition. All later texts are merely reprints of the Venetian edition, with the exception of one published at Leghorn (1650-59), which contained additions and corrections as well as a commentary by R. Abraham Gedaliah. The latest text (Wilna, 1898) is based on the editions of Lublin, Venice, and Leghorn, and contains foot-notes giving the sources, a glossary of difficult words, and an index of the chapters and verses of Biblical passages. To this edition is appended a brief commentary by Abraham Abele Gumbiner of Kalisz entitled "Zayit Ra'anan." Schürer, Gesch. 3d ed., i. 146.